List of illustrations; Acknowledgments; Abbreviations; Introduction; 1. The seaman as man of the world: a tour of the North Atlantic, c. 1740; 2. The seaman as collective worker: the labor process at sea; 3. The seaman as wage laborer: the search for ready money; 4. The seaman as plain dealer: language and culture at sea; 5. The seaman as the 'spirit of rebellion': authority, violence, and labor discipline; 6. 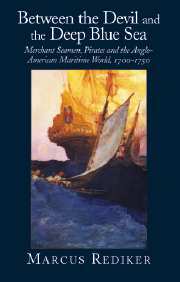 The seaman as pirate: plunder and social banditry at sea; Conclusion: the seaman as worker of the world; Appendices; Index.